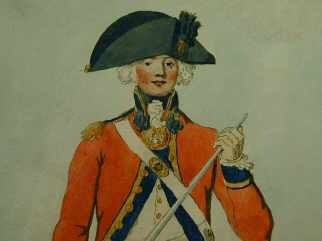 Part of an etching of a First Foot Guards officer 1792. By Thomas Kirk, after Edward Dayes, this particular print was hand colored by no less than the young JMW Turner. The Edward Dayes series of prints of 1792 were done following the 1792 Royal Warrant (the first time the Guards were ever included in the regular warrants). This print shows a Officer in frock coat review order. Note the changes from 1770, with the stand up collar, the more cut away coat and shorter waistcoat... a transitional to the typical Napoleonic wars type. The originals are in Her Majesty's collection. were the most junior officers, and could be as young as fourteen. however an ordinary young lad of this age could become a drummer, but a lad whose family could afford the high cost of a commission, would have their lad become an Ensign. hopefully, he would also have acquired some education, as well. was an ensign in the First Foot Guards. We don't know much about his military service, but his background will give you an insight into the aristocratic families from which the Guards drew many of their officers. By the way, "landed gentry" actually refers to those in the Peerage: they don't actually have to possess land, just as the "Peers" are not actually 'equals'. Could be it's all tied in with the 'Public Schools' in Britain, which are actually private. Go figure. In other words, George was way down in the pecking order, and the title succeeded to his older half-brothers Washington (the 2nd Earl), then to Henry (the 3rd Earl.) Henry's sons Lawrence (the 4th Earl), Washington (the 5th Earl), and Robert (the 6th Earl) succeeded to the title. The Hon George thus had precious little chance of obtaining the earldom. You might think that Washington (the name of the 5th Earl, who died in 1787) was an embarrassing name to have, given the unpleasantness in the American colonies at the time, but it in fact was the family name of the first wife of the first earl. As a matter of fact, Robert Washington Shirley is the 13th Earl Ferrers, who serves in today's House of Lords. While we're on names, the family name Shirley is simply 'shire-lea' or 'meadow belonging to the county'. Washington was used in the Shirley family as a given-name, and today Shirley has itself gained popularity as a given-name. The Honorable George had the honor of attending Queen Anne as a page. When he was sixteen in 1721 he purchased (or had purchased for him!) a commission of Ensign in the elite First Foot Guards. He was with the Guards at the siege of Gibraltar in 1727, and (like many of the soldiers) unfortunately caught yellow fever there, narrowly escaping death from this dread pestilence. He served honorably until shortly after his older brother's death in 1738, when he inherited considerable property, and didn't need to risk his life any more. No word on whether he was able to purchase a lieutenancy or captaincy in the Guards - he would have been old to be merely an ensign at age 33. During his lifetime, he was witness to the madness of the third Earl (a certified lunatic, who mercifully had no children), who died in 1745, the time of the "Scotch Rebellion". Even worse, he saw the earldom succeed to a monster. Lawrence, the fourth Earl Ferrers was cruel to his wife who obtained a separation from him by Act of Parliament. As if this were not enough, more ignominy was heaped upon the family when Lawrence murdered Johnson, his steward. Earl Ferrers was tried and sentenced to death. He was hanged at Tyburn, like a common criminal on 5 May 1760. The event was a national sensation, and is extensively recorded in print and in prints of the time. Fortunately, the fifth Earl was a good fellow. He was a Vice Admiral of the Royal Navy, and being interested in things scientific, became a Fellow of the Royal Society. King George was pleased to grant him a patent which restored the Ferrers estates (which had been forfeited to the Crown on the singular death of his brother). The Hon George married in 1749, peaceably begetting four children, and living in great comfort at a family seat at Twickenham, on the charming upper reaches of the Thames, until his death in 1787. Maybe he wasn't an entirely typical Ensign, since his relatives were notorious, but he was certainly typical of the minor aristocracy who aspired to become officers in that most exclusive of British regiments, the First Foot Guards.